BIELENDA Green Tea Face Essence In Pearls Anti-Acne For Mixed Oily Skin 30g. Gel-pearl essence is the perfect product for regular and effective care of combination skin. tree oil, as well as brightening vitamin B3 and tonic flower water from the leaves of green tea. Lower tendency for the appearance of acne and seborrheic. Scrub evenly on face, neck, avoiding the eye area. Scrub gently removes unnecessary horny layer of the epidermis without friction. accelerates regeneration and skin renewal - reduces roughness - evens skin well spread with a gentle slipping. Pure 02 T-Zone Gel is a hydro-alcoholic gel with salicylic acid and acnacidol that regulates sebaceous gland secretion of greasy and acne prone skin. PURE 02 T-ZONE PURIFYING GEL WITH ANTI-ACNE AGENTS 100ML. 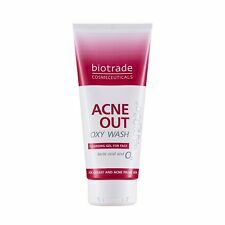 Acne Out OXY WASH is a gentle and mild cleansing gel enriched with oxygen and lactic acid. It is designated for oily and blemished skin prone to frequent inflammations. The cleansing gel removes excessive sebum and accumulated impurities, improves the skin's appearance and its hydration levels. White clay and diamond thus creating products of exceptional white colour and comparable detoxifying and refreshing properties. White Carbon products have strong purifying and detoxifying effect. The cream prevents the formation of pimples, nicely mattes. We are very serious against false claims. Any attempts with intend to manipulate our system will result in appropriate repercussions. ISBN Does not apply. EAN Does not apply. 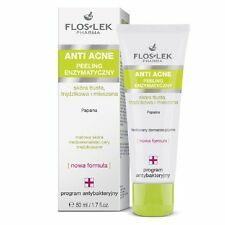 Concerns Acne. Formulation Gel. We cannot be held responsible for delays caused by carriers. PORE REFINER. Combination or oily skin. Correcting concentrate for dilated pores. Refines the skin texture. Prevents imperfections. Durably matifies. Expiry Date: 01/2021. Purifying Cream from Claude Lagny. PURIFYING CREAM. Purifying cream regulates the skin flora and strengthens the skin's natural resistance. Purifying cream absorbs oil surplus and nourishes the skin. Active Care Acne out active lotion is designated for skin with light to moderate acne with pustules and oily skin prone to irritations. IMPORTANT: After applying Acne out active lotion hands must be washed with water! Apply a suitable Bielenda cream. Afterwards, apply a suitable Bielenda cream. Żel delikatnie rozmasować na zwilżonej skórze, następnie spłukać wodą. Stosować codziennie rano i wieczorem lub częściej w zależności od potrzeb. EFFACLAR DUO( ) UNIFIANT. & GIFT EFFACLAR GEL 50ml. All the imperfections and anti-marks efficacy of EFFACLAR DUO( ) reinforced by an instant unifying effect. Apply to whole face as daily care, after cleansing skin with EFFACLAR FOAMING GEL. Size 6.7 Oz / 200 ml. Box Condition Minor imperfections, may have tester sticker. This product is designed for problematic and greasy skin. Efficient combination with glycolic acid cleans the dirty skin and shrinks pores. It has a matting effect and regulates the formation of sebum. Neostrata Sheer Hydration SPF 35. Neostrata Sheer Hydration SPF 35. This product contains NeoGlucosamine, clinically proven to help reduce the appearance of dark spots from ageing and acne for more even tone, and to improve skins texture and firmness. Intended for: mixed skin, oily skin, prone to acne, dry skin with imperfections. eliminates blackheads and acne. The cream is an ideal base for make-up. Soap And Glory Clear Here T-Zone Moisture Lotion. Spots, Pores, Cleanse Skin. For sale is Clear Here, another well loved discontinued product by Soap And Glory. - smooth and protect the skin. For oily/combination skin types. - prevent blemishes. Foaming Gel. This soap-free foaming gel is enriched with Myrtacine® and cleanses and purifies skin gently and deeply. Lather and rinse throroughly. Apply morning and evening, on damp skin. Visibly mattifies the skin. Pore & Shine Daily Scrub. with its exfoliating micro-beads and salicylic acid, it cleanses deep down to unclog pores for visibly refined-looking skin. Visibly Clear. Afterwards, apply a suitable Bielenda cream. PASTA – rozprowadzić na wilgotnej skórze, delikatnie rozmasować, spłukać wodą. Stosować codziennie rano i wieczorem. PEELING – wmasować w wilgotną, oczyszczoną skórę, spłukać. Aqua, Alcohol, Glycolic Acid, Propylene Glycol, Ammonium Hydroxide, Polyquaternium-10, Sodium Hydroxide, Tetrasodium EDTA. Shine is minimised and skin feels softer, smoother and is less congested. Use twice daily after cleansing. Won’t clog pores. Leaves skin silky and fresh with a radiant glow. Sick of the shine in your T-zone: on your forehead, nose and chin?. Just when your cheeks are looking dry and dull?. With its ultra-light texture, it’s perfect for combination skin. Pink Grapefruit Daily Scrub. Visibly Clear. Unclogs pores to clean deeply and help eliminate spots and blackheads. Visibly mattifies the skin. and unclogs pores. Pore & Shine Daily Wash. Visibly Clear. It rinses clean without over-drying. Softens facial hair before shaving. ERIC FAVRE DETOX CREAM is the ideal detoxifying solution for mixed or oily skins. Its formulation enables to fight against acne, improves micro circulation with an anti inflamatory effect. Finally it clears effectively the skin. Active ingredients: Salicylic Acid, Vitamin B3, Green Tea Extract, Allantoin, D-panthenol. does not cause irritation. gently and thoroughly cleanses the skin. removes dead skin cells. regulates sebum secretion. 2 x Neutrogena Visibly Clear Foaming Face Wash 150ml Each. The cleansing properties of this spot-clearing formula help fight and reduce breakouts, whilst clearing and reducing the discomfort, redness and size of existing ones. Apply a suitable Bielenda cream. Żel delikatnie rozmasować na zwilżonej skórze, następnie spłukać wodą. Stosować codziennie rano i wieczorem lub częściej w zależności od potrzeb. Następnie nałożyć odpowiedni krem Bielenda. Breaks down dead skin cells to open the pimple. Always read the label. Use only as directed. If symptoms persist see your healthcare professional. Apply cream to the area affected by pimples. For the first week, apply once daily. DCL Clear Skin Anti-Blemish Hydrator - 50ml, keeps problematic skin balanced. This smart, clinically-proven formula combines 2% Salicylic Acid with Lactic Acid to effectively clear out congested pores, remove blemish-causing bacteria and exfoliate dead cells in order to treat and prevent breakouts. Brewer's Yeast adds smoothness and elasticity to the skin, helping natural and beauty. Beneficial effects on hair and nails. Stimulates the activity of proteins keratin and collagen. LA ROCHE-POSAY EFFACLAR HCREAM 40ml. regenerates skin barrier and renews its elasticity. Apply morning and evening to cleansed and thoroughly towelled skin. soothes irritation and reddening. Let us know if our service could be better! Carbon Detox Peel Off Face Mask by Bielenda. the condition of mixed and oily skin. The cleansing carbon mask with powerful detoxifying action instantly improves. Gel texture of the mask quickly dries on the skin creating a hydroplastic layer that. mene & moy Oily/Acne Skin Gel - 50ml, for acne prone skin, use after cleansing. Glycolic Acid loosens and removes dead skin cells and excess oils from within the pores while B Chloride kills acne causing bacteria in order to prevent and reduce the severity of future breakouts. When used regularly the skin looks less congested, less shiny and is more manageable. Daily Foaming wash. Neutrogena Visibly Clear. Provides a visibly clear skin. Fight spots for one less stress. Sebium Serum. Tube 40 ml with applicator. Tipo de piel Piel con tendencia acnéica. Gentle paraben-free foaming cleanser that removes excess oil, make up and dirt while deeply purifying the pores and balancing the skin. This gentle paraben-free cleansing and balancing gel deeply purifies pores and clears oily combination skin to give you a perfect matte complexion. For best results use daily until skin appears clearer. Gently apply onto skin in circular motion for 1-2 minutes, rinse off with Luke warm, then pat dry. Just rinse thoroughly with warm water. WARNING: This product contains high levels of glycerine. Lightening Facial Soap (Cleanser). Peel-off Beauty Mask.